Not surprisingly, email marketers obsess over the subject line more than any other part of an email…by far. This makes sense, right? For the most part, the subject line determines whether or not your recipients will engage with your email. Even if they know and trust you as a sender, a dull subject line can disinterest them, causing them to pass over your email and wasting all that time you spent writing and designing it. And that’s not even the whole battle. This is a good place to start. Make sure the subscriber has an idea of what to expect when they open the email. This doesn’t mean you have to give the whole email away. For instance, teasers are very effective at inspiring an email open, which I’ll touch upon in a bit. You want the most important part of your subject line up front. You should do this for two reasons. First, so recipients see the important information right away. Don’t make them read for it – research shows interest dips after 35 characters. Second, so your subject line doesn’t get cut off by the email client. The absolute last thing you want is for the most important piece of the most important part of an email to not even show up. Try to stay under 45 characters. I know this sounds difficult, but numerous studies have shown shorter subject lines equate to higher open rates. Why do you think that is? There’s actually a very clever reason for it, and to show you I’d like to conduct a quick experiment. Below is an example from my own Gmail “promotions” inbox. Where are your eyes naturally drawn to? I’m guessing right around where Groupon and Allen Edmonds are located. Both have the shortest subject lines by far and are serendipitously positioned right next to each other (or…maybe they colluded?!). Either way, you get the point. 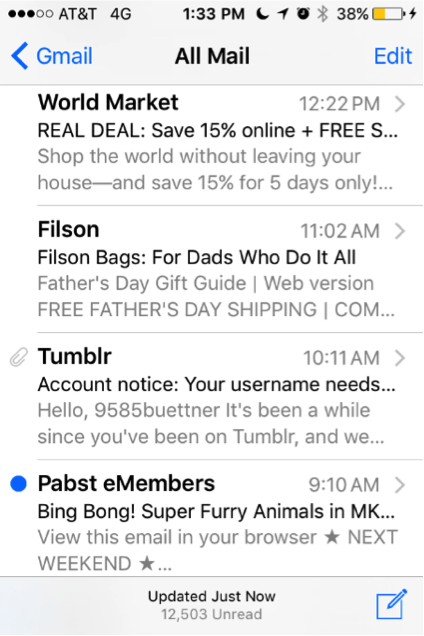 In a sea of words, these two subject lines stand out because they have less text. Keep this in mind when you’re writing your subject lines. This is one of the best ways to stand out. A great example is the brilliant work Barack Obama’s email team did for his 2012 presidential election. 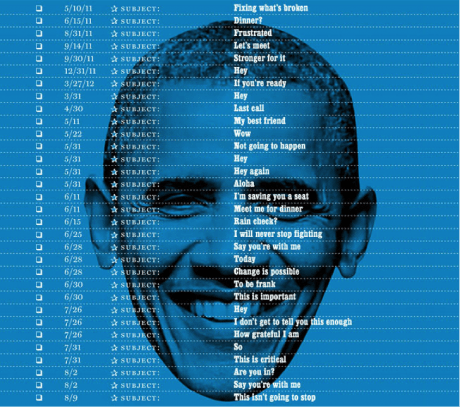 They’re most successful subject line simply said “Hey.” In fact, below is a graphic from New York magazine that lists other subject lines used in the same campaign. All this being said, and although it’s important, we don’t write short subject lines just for the visual advantage. We’re in the age of mobile, and we have to start optimizing for it, folks. 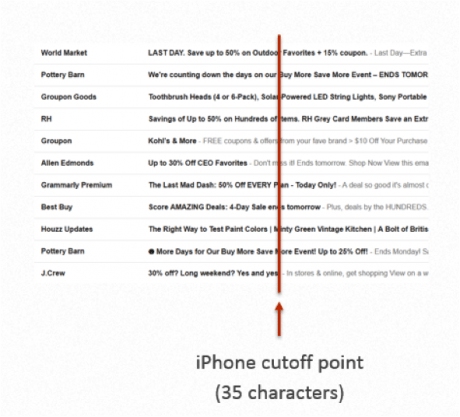 55% of email opens are coming from mobile devices today and they don’t allow anywhere near the space computers do for subject lines (as you can see, iPhones only allow 35 characters). That’s not a number you can ignore any longer. I’m willing to bet the Obama campaign stayed under 35 characters for this very reason. Here’s a quick look at my inbox from my smartphone. At first glance it should be apparent that because of how mobile email is formatted, the visual advantage of having a short subject line is diminished. Now you start to see the other optimization tactics we discussed earlier emerging. World Market is taking advantage of front-loading information. Even though it gets cut off, I know what to expect if I click on it. Filson’s entire subject line fits in my inbox. This most likely wasn’t a mistake. It’s also quite descriptive. I know there’s a Father’s Day oriented message inside. They also make great use of the pre-header text below it, which I’ll be covering in Anatomy of the Perfect Email: Part 2. Tumblr is frontloaded. I know this email has to do with my account settings. And finally, the Pabst Theatre (which is an awesome local theater here in Milwaukee) is letting me know right away that the Super Furry Animals are in town. Now, I have no idea who The Super Furry Animals are (even though they do sound interesting) so I know I’m not going to attend the concert. Hence, I don’t have to open the email. Time saved. 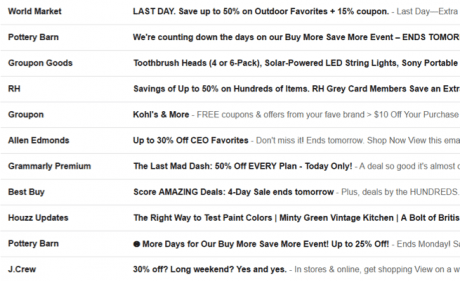 Personalizing subject lines has long been a favorite method of inspiring subscribers to open emails. Use the subscriber’s name if possible. Even though they know it’s generated by software, they’ll appreciate the extra effort. I think it definitely says something about a company’s culture when they refer to their subscribers by their first name. Obviously, you’re not always going to be able to use your subscribers’ names. In these cases, use “you” and “your.” Mailchimp conducted a study where they analyzed 200 million emails and found subject lines that included the subscriber’s name, or sprinkled in “you” or “your” received the highest open rates. This is a very popular tactic and one you might already be taking advantage of. Regardless, this post wouldn’t be complete without quickly mentioning this extremely effective technique. 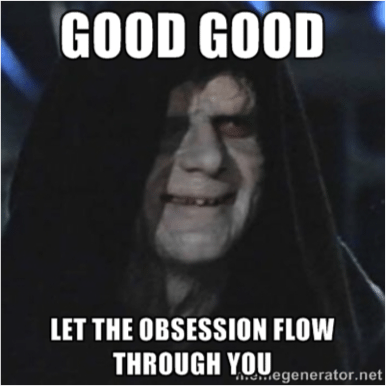 Essentially you’re creating a fear-of-loss reaction in the recipient. Assuming the offer is good enough, you’ll almost always get a great response out of creating a sense of urgency. Questions naturally provoke answers, and emails with questions as subject lines tend to provoke opens and replies. This is because they get the reader to think about how the subject matter applies to their own life and arouses a sense of curiosity to learn more about the subject or solution you can provide. Naturally, you want to try to ask questions relating to the recipients’ past experiences or pain points to show you empathize. This is pretty much marketing 101: focus on the benefits, not the features. People really don’t care about your product’s latest technology, let alone what you call it. They care about things like how it’s going to make them a better person, how it’s going to make their lives easier or how it’s going to make them look good in front of their peers and superiors. By writing a subject line that highlights a benefit, you cut straight to the source of the problem, and create a deeper, more urgent curiosity in how your solution can solve it. Remember, we’re trying to get people to open the email. So why not just tell them to? This is pretty much building a call-to-action into your subject line. Calls-to-action can be very effective, that’s why we implement them all over our websites. In fact, one of the ways you probably grow your list is via a call-to-action that links to a signup form. There’s no reason it can’t be effective in an email subject line, as well. You can create what’s called a curiosity gap. This is an extremely effective tactic to inspire email opens. The idea behind a curiosity gap is to tease at the idea that there’s a way to solve a problem your subscribers have. However, you don’t give away the solution in the subject line. The recipient is left with an information gap, and if it touches on a real paint point it can provoke them to open the email to learn about your solution. You can also try being humorous or surprising. It’s no secret people enjoy humor, and if you really get them to chuckle with a funny or witty subject line, an email open isn’t far behind. The only issue with this is that it’s very difficult to be genuinely funny, and most of the time brands miss the mark. Try and be as conversational in your writing as you can. This really goes for pretty much any form of communication you have with your customers. The more “human” you can be, the better. Using conversational words like “uh-oh,” and phrases like “did you see this?” in addition to not capitalizing every word (and even something as small as leaving out the period at the end) comes across as helpful and friendly — not as a company trying to upsell you. I always like to share tips and tricks from industry leaders if I find them useful. Wordstream, a respected brand in the digital marketing industry, says to write 10 subject lines for each email you send out, and then pick the best two for testing. I personally love this method and try to use it whenever I can. The point is to not stop at the first, second or third line you write, because you can almost always do better. So there you have it. I hope you found this post helpful. We’d love to hear about other tactics you use when writing subject lines. Please share in the comments section below! And stay tuned for Part 2!